Just like most people, especially food bloggers, I'm a schmuck for products that have the "NEW" tag on them. Working in marketing myself outside this blog, I know it is a tried and true way to draw attention to your product and let general human curiosity takeover so that the consumer will buy your product. 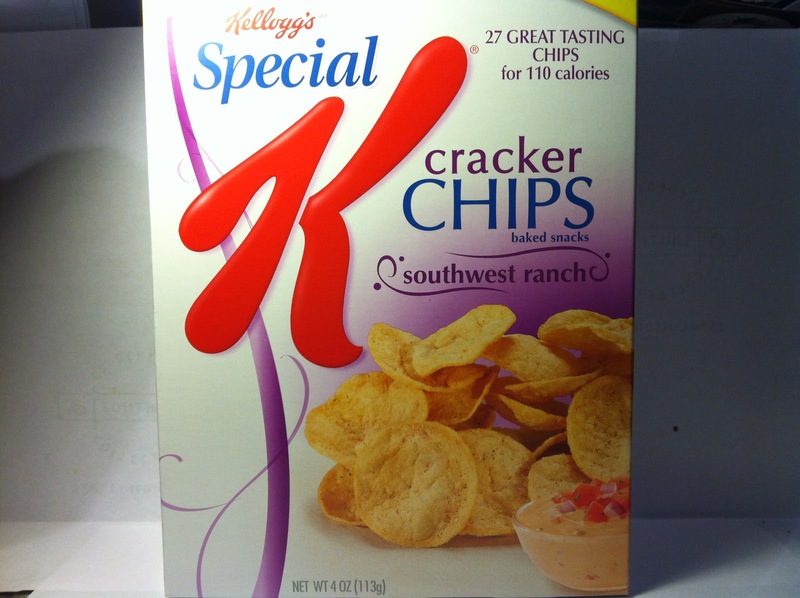 It's that tried and true method that caused me to dive into another one of Kellogg's Special K products and pick up this new product in the Kellogg's Special K Southwest Ranch Cracker Chips on a recent trip to my local Meijer. A four ounce box of these cost me $3.00 and each box contains roughly 3.5 servings at 110 calories per serving. How big is a serving? Well, I'm glad I asked myself that because the back of the box proudly displays that a serving is 27 chips. Obviously the box displays what these look like, so there was no real mystery for me as to what they would look like when I opened it up. What did surprise me, I suppose, was how airy and light these were. I guess since the tagline on the box says that these are "Not quite a cracker and not just a chip," I should have expected that, but as any past reader of the blog would know, I'm not particularly bright. 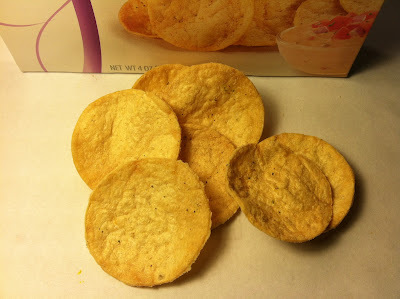 In terms of the cracker chips themselves, they were baked (dry and made up of potatoes and brown rice) and had a noticeable dusting of the Ranch and Southwest seasonings on the chip and definitely smelled like an odd mix between those two flavors as well. Most people know what Ranch smells like (sour cream, onion powder, etc. ), but I would say that the Southwest flavor was more of a chili powder type smell. Additional seasonings, according to the box, included garlic powder, tomato powder and "Spices." I guess "Spices" means it is a secret. Whatever. Biting into this, it was just like biting into your typical baked potato chip, so there was nothing odd about these at the outset. As I chewed through each chip, I could definitely taste the sour cream, garlic and onion powder in the Ranch seasoning and while it was a strong taste, it was not overwhelming. One thing that was particularly strong and almost borderline overwhelming was the Southwest seasoning (again, I'm guessing this was chili powder, but since they don't list that ingredient on the box, I can only guess this was the secret in the "Spices" ingredient). I could not believe the amount of heat that was being brought by the powder and in fact, it was almost too much and since I'm a genuine spice lover, me saying something may have been a bit too much means that an ordinary person would probably be turned off by it. That said, while the spice was strong and more than I expected, it worked well with the Ranch flavoring and made a solid combination. Buy It or Fly By It? I would give this a BUY IT rating. It's a different type of combination, but in my mind, it works and is a low calorie snack. Like I said though, if heat is not your thing, then you are probably not going to like this chip as it may end up being more than you bargained for. was the texture like popchips? Have never eaten Pop Chips, so I can't answer that unless take a complete guess.